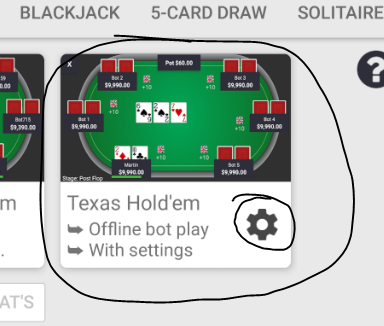 At online Holdem server has bots too so people are not there alone playing. At least at start since it may be hard to impossible to get users to play my game. Anyway, here's explanation for Online game mode buttons. Login, from here you can create new account or login to your account. Your account hold's your winning count, losing count, amount of money and in the future achievements and more interesting statistical stuff. I don't gather nothing personal and I don't care to do so. My stat's, shows you your current amount of money, win and lose count and so on. In the future more and more stuff. Room selection will only show you rooms where is room for new player. 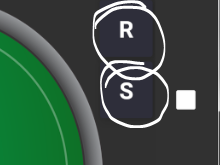 Rooms have minimum bets differences which means what is the minimum pot in the game on every round. 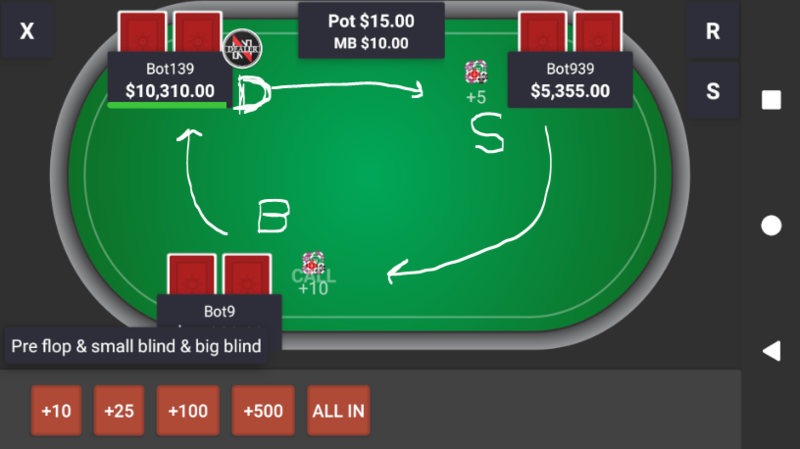 For example if minimum bet is 10$ then small blind is 5$ and big blind is 10$ so there's always at least 10$ in a pot. 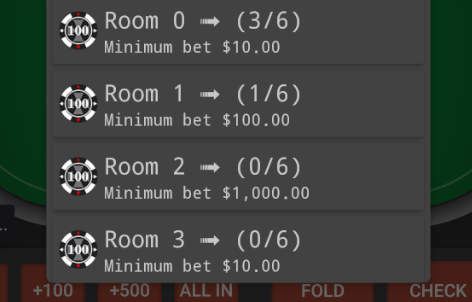 So in minimum bet 1000$ room there's 500$ small blind and 1000$ big blind. R stands for Rooms, by pressing R you can select new room to play in. S stands for Spectating which means when you come into online game you must click back button to close room dialog and then press S to open selection for room spectating mode to "stalk" some room game play. Next thing is rules so, scroll down for Holdem rules. Offline holdem is similar way from logic point to online but it only has bots and you. This mode doesn't require internet connection and works fully offline. All the calculation stuff is made on your phone. "Gear" button is for settings where you can tweak game a little bit at how many bots you want there to be, do you want tutorial window, debug window or automatic next round. Scroll down for Holdem rules. I had hard time to understand Hold'em rules so now when I learned those I think I can explain them in short way "for dummies" like me. Every turn has a DEALER player who deals the cards so he is called dealer. Dealer turn goes always for next player in table @ next round. Always next player from dealer is small blind player and then next is big blind player. Small blind is always half of the rooms minimum bet and big blind is minimum bet at room. Note: small and big blind is ALWAYS payed even if player folds. This way table ALWAYS has something in a pot so its worth to play. Dealer, small blind and big blind turn are always circulating to next ones and next ones so game is always going equally, so everyone has these turns and everyone will lose money if folded at small or big blind. Picture above explains game turn circulation. Well what else... in Texas hold'em every player has two cards and 5 common shared cards which are all players cards (in the middle of the table). There's four betting rounds in the game before middle cards after hole cards, after first three common cards, after fourth common card, fifth and then comes show down. Winner is the player with best hand. Just play to learn more, there's nothing to lose except virtual money.